Do your dreams of owning a log home remain unfulfilled? Do you “pine” for a log home of your own, its vaulted timbers and the warmth of its solid embrace? Well stop dreaming, and let BW Construction help make your dreams reality. Want to take a Permanent VACATION - Build a Log Home! BW Construction, your local HBA 2010 Award Winning Builder and authorized Lodge Logs dealer/builder, has been serving customers in Western Washington since 1987. 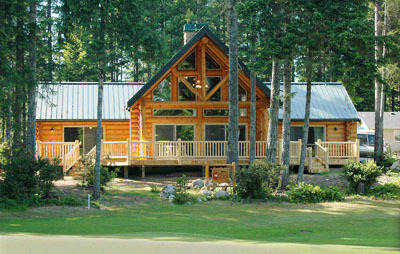 Lodge Logs has been the Northwest’s premiere log home manufacturer since 1975. BW Construction and Lodge Logs have teamed up to give you more: more value and choices, the highest quality products and craftsmanship, expert advice and total customization to fit your lifestyle and property. A tour of log homes is available by appointment. Please visit our sales office and design center for more information at 708 Broadway, Suite 202-B, Tacoma, WA 98402 or call 253.238.9079.